Gooding and Company held its 2010 Pebble Beach sale on August 14th and 15th at the Pebble Beach Equestrian Center in Pebble Beach, California. David Gooding assumed the Pebble Beach Auction mantle six years ago, to the day, in fact, on August 15, 2004. He brought Charlie Ross over from the UK to call the sale, and they meshed on the block to an unprecedented degree. Charlie’s clear, concise, distinct presentation identified every bid with precision. David’s rapport with his bidders personalized the process. It was a revelation. Six years later the auction is much different. It’s two days instead of one and the consignment is laden with million dollar cars, but the presentation has lost none of its exceptional immediacy, clarity and personality. 2010 just beat the record-setting sale total of 2008, but did it with fewer cars and fewer sales. 2010 had exactly the same median (half sold for more, half sold for less) transaction as in 2009. The difference? 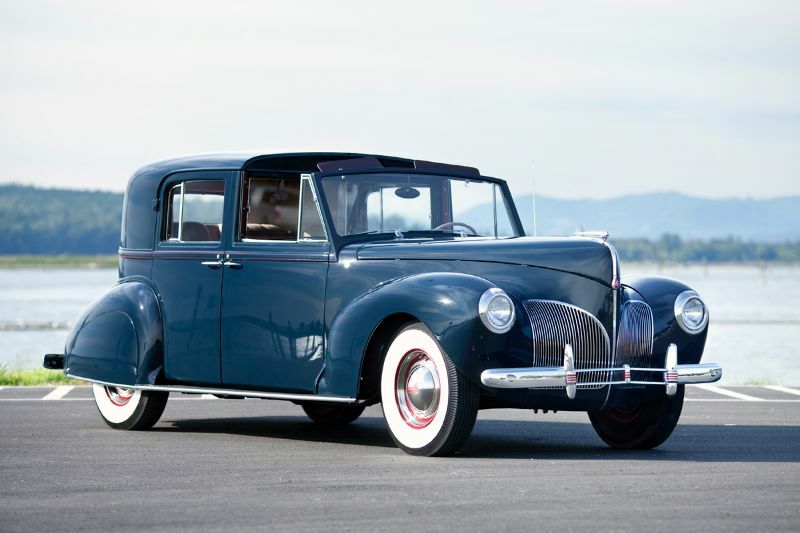 Twelve cars sold for hammer bids over a million bucks including the two top sales from the Monterey auctions. 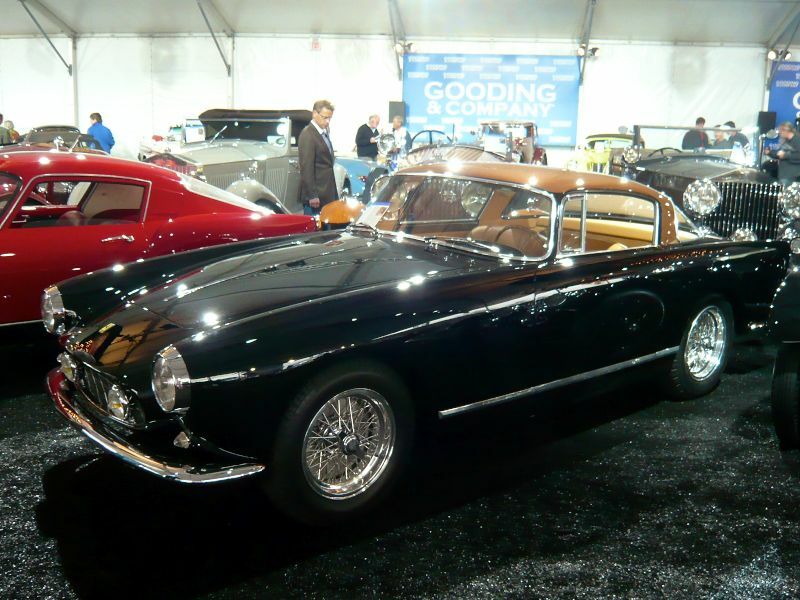 Presented on Saturday and Sunday evening (the latter after the prize awards at the Concours), this is a must-attend finale to the Monterey week. Even tired, used-up, sunburned and sleep-deprived, it’s worth the effort to close out Monterey Week at Gooding’s. 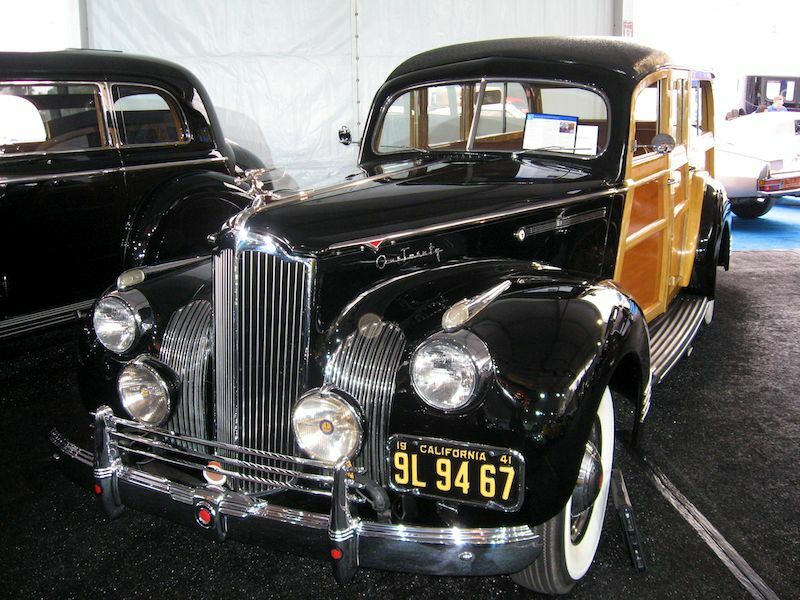 Lot # 013 1915 Packard 3-38 Six Limousine; S/N 75385; Engine # 75385; Black, Dark Blue/Black leather, Blue-Grey cord; Estimate $150,000 - $200,000; Visually maintained, largely original, 3+ condition; Not sold at a Hammer bid of $120,000 -- Warner speedometer, Waltham clock, flower vases, umbrella holder, jump seats, speaking tube. Original rear upholstery. 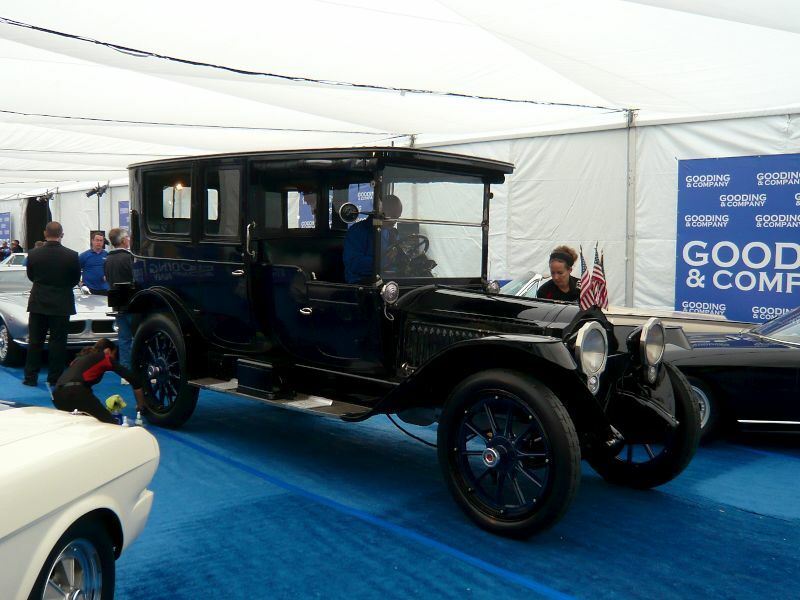 Handsome older cosmetic restoration of a largely original car believed to have a 1913 body on a 1915 chassis. Stately, elegant and very desirable. This impressively preserved Packard deserved to be bought, or sold, depending upon point of view. The bid was modest for the car's history and inherent quality, but reasonable enough considering the earlier formal coachwork. 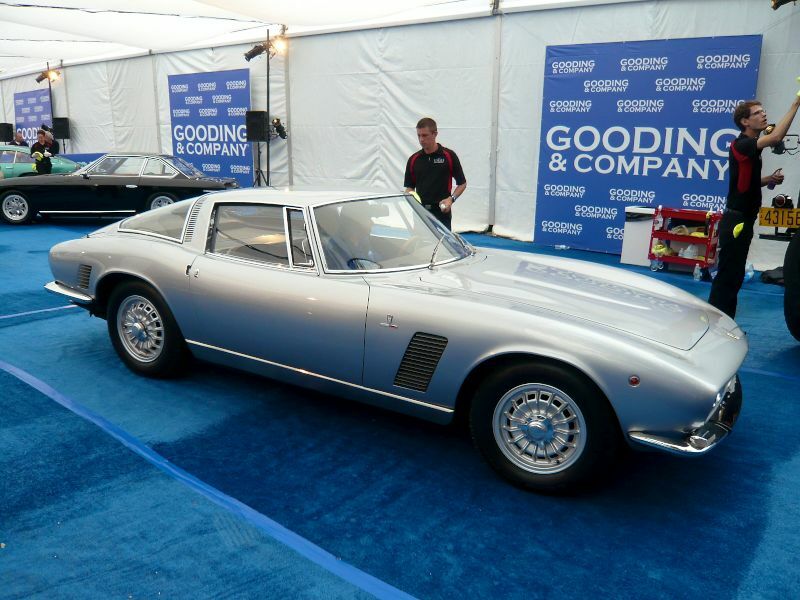 Lot # 014 1967 Iso Grifo GL Coupe, Body by Bertone; S/N GL650078; Silver/Dark Blue leather; Estimate $160,000 - $210,000; Visually maintained, largely original, 3 condition; Hammered Sold at $125,000 plus commission of 10.00%; Final Price $137,500 -- 327/350hp. Good repaint, otherwise original and tired with fair chrome and a sound but aged interior recently updated with new package shelf and dash top. Hurst shifter, aluminum centerlock wheels. Never restored with just three owners from new, an attractive and usable, largely original, example. One of the very best of the Italian-American hybrids of the Sixties with dramatic and attractive coachwork designed by Giugiaro with abundant power from the Corvette engine. The bidders here bought it right and maybe even got a bit of a value for its originality and limited ownership history. 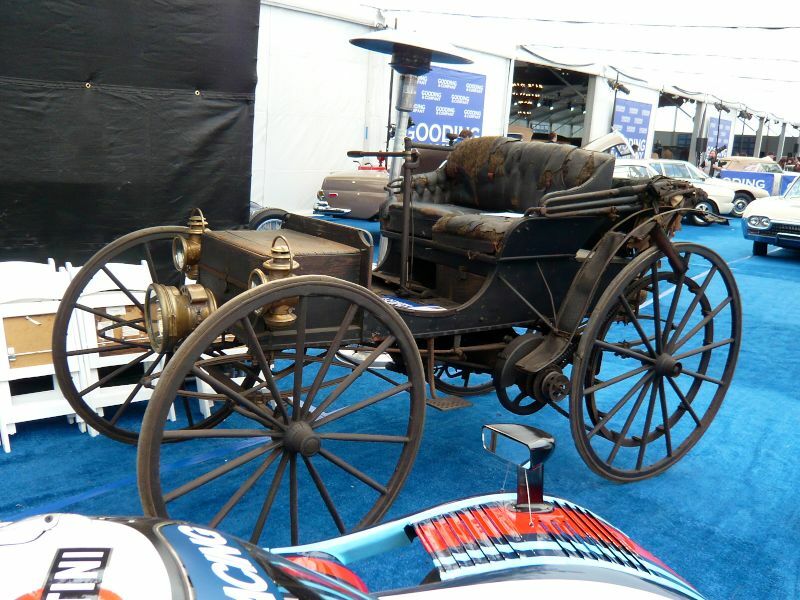 Lot # 015 1908 Holsman Model 10-K High-Wheeler; S/N 3031; Black/Black leather; Estimate $80,000 - $120,000; Unrestored original, 3 condition; Hammered Sold at $41,000 plus commission of 10.00%; Final Price $45,100 -- Righthand tiller steering. Single headlight, brass kerosene sidelights, Rubes-style bulb horn. One of only two known Holsman Model 10-Ks, with opposed two-cylinder engine and infinitely variable speed chain/belt drive using tapered drive sheaves that close up to expand their diameter. Reverse engaged by moving a small drive wheel back to friction drive the solid rubber rear tires directly. A remarkably ingenious piece of machinery. Sound and usable upholstery with reupholstered driver's seat cushion and seat back. No Reserve. Sold just a little while ago from the Buess Collection at Worldwide's Houston Auction for $41,800, exceptionally original and well preserved. Runs and drives, but the estimate is completely irrational for a high-wheeler that isn't Brighton eligible. The result here validates its value. 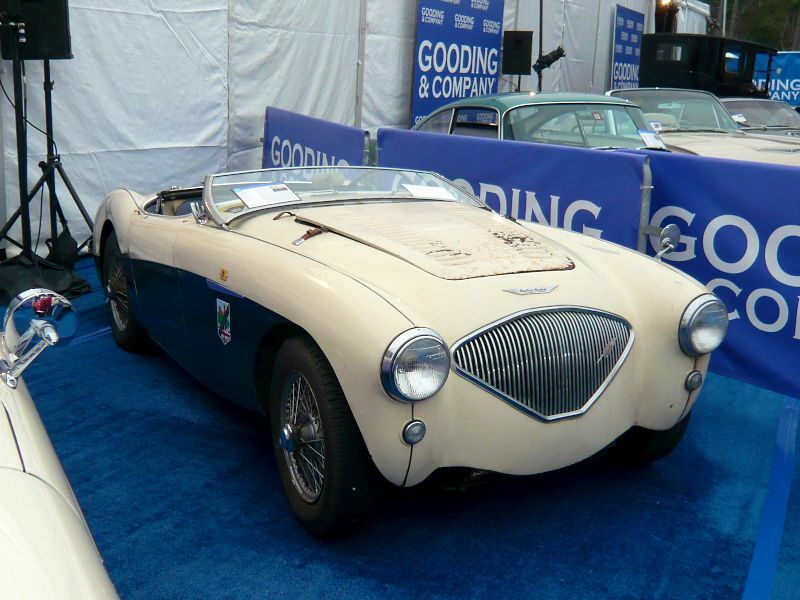 Lot # 018 1955 Austin-Healey 100-4 BN1 Roadster; S/N BN1L227462; Engine # 1B227462M; Cream, Dark Blue/Blue leather; Blue leatherette top; Estimate $100,000 - $150,000; Unrestored original, 4- condition; Hammered Sold at $65,000 plus commission of 10.00%; Final Price $71,500 -- Silver painted wire wheels, overdrive, louvered hood and other 100/M features. Dead, cracked paint, stiff cracked, torn upholstery. Known history from new. Solid but needs everything. No Reserve. The bidders weren't as impressed by this car's history and its unusual configuration as the auction company's cataloger was but it still brought a 100/M price and will start many conversations at Austin-Healey and British car events. 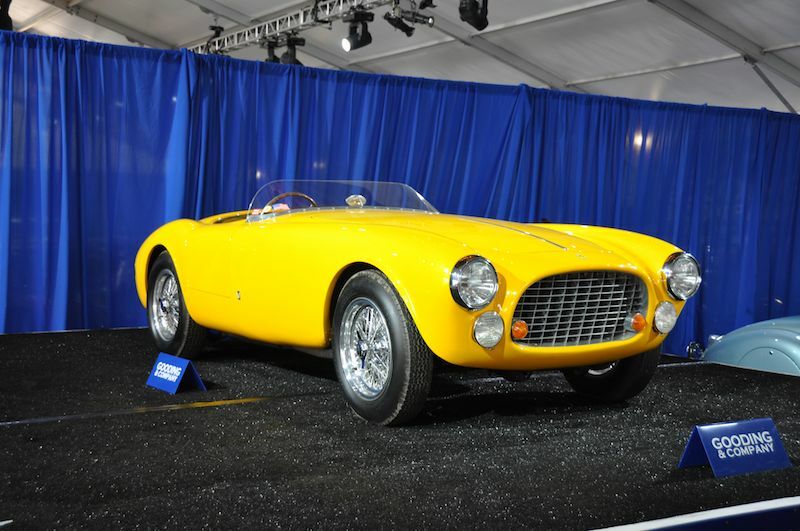 Lot # 019 1951 Ferrari 340 America Spider, Body by Vignale; S/N 0140A; Engine # 0140A; Yellow/Brown leather; Estimate $2,000,000 - $2,600,000; Older restoration, 2- condition; Hammered Sold at $2,300,000 plus commission of 10.00%; Final Price $2,530,000 -- RHD. Chrome spoke Borrani wire wheels, full width Plexi windscreen. Reportedly original chassis, engine and body. NY Salon display, eventually established a long but unimportant West Coast history. Acquired by Gil Nickel in 1980 and restored by Griswold, winning the Hans Tanner Award at Pebble Beach in 1982. Later re-restored by Phil Reilly & Co. with subsequent awards. Mille Miglia Retro and Colorado Grand participant. Paint crack by right rear hood corner, bubble on left front fender but otherwise in remarkable condition reflecting the quality of its restoration(s) and care. This is a car that is much more famous and accomplished in the hands of its recent (and particularly most recent) stewards than in its early history. The Pebble Beach bidders accorded its specifications, beautiful Vignale coachwork and provenance appropriate deference with this result. Lot # 022 1941 Packard 120 Station Wagon, Body by Hercules; S/N 14932034; Engine # 311072; Black; black composite top/Brown leather; Estimate $160,000 - $200,000; Older restoration, 2+ condition; Hammered Sold at $175,000 plus commission of 10.00%; Final Price $192,500 -- Trippe lights, tri-bar bumper, single covered sidemount, three-row seating, wide whitewalls, trim rings. Nearly flawless paint, wood and brightwork with little evidence of age or use. Restored using a very well preserved car as the basis and well maintained since. CCCA Senior winner in 1990. An unusual, distinctive, quality Packard woodie, bought for a reasonable premium over its less costly counterparts from Ford and Mercury. The result is fair to both buyer and seller. Lot # 024 1937 SS Jaguar 100 3 1/2 Liter Roadster; S/N 39002; Engine # M501E; Black/Black leather; Estimate $750,000 - $950,000; Recent restoration, 2+ condition; Hammered Sold at $950,000 plus commission of 10.00%; Final Price $1,045,000 -- RHD. Excellent paint, chrome and interior. Freshly restored to better than new and loaded with bling. 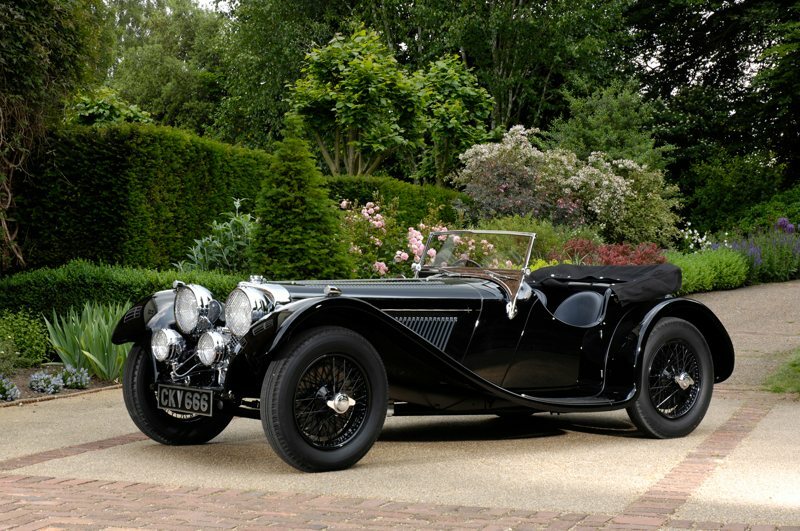 2009 Pebble Beach class winner, the oldest surviving 3 1/2 litre SS100. Reported sold at Bonhams Goodwood Revival sale in 2006 for $296,230 as an older restoration out of the Kaus Rosso et Bianco Collection. Subsequently restored to beyond perfect condition, it is absolutely no surprise at all that the Pebble Beach bidders got all worked up over this SS100. It was eye-candy. That said, it is surprising to see a recent PB winner bring such a premium. Its show days are numbered and it's almost too beautifully restored and presented to risk stone chips and bug splatter ... the operative word being ‘almost.’ A car that endorses the principle, buy the very best you can afford: this is the very best but it brought a far beyond perfect price. Lot # 027 1957 Ferrari 250 GT Boano Low-Roof Berlinetta, Body by Boano; S/N 0641GT; Engine # 0641GT; Black, Copper roof/Beige leather; Estimate $600,000 - $750,000; Older restoration, 1- condition; Hammered Sold at $550,000 plus commission of 10.00%; Final Price $605,000 -- Chrome wire wheels. Known history in the U.S. since 1977, restored in 2004, Platinum at Cavallino and FCA Southwest Region. A little oil mist low down in the engine compartment that will disappear with some fresh detailing. Excellent paint and interior, good chrome. Much better than new. Offered by Bonhams at Quail Lodge in 2003 where it no-saled at $200,000, then sold by RM in Monterey last year for $530,000 hammer, $583,000 with commission in essentially the same condition as here showing just 418 fewer km on the odometer. A particularly attractive and well-maintained example of an increasingly desirable Ferrari. The result here suggests the run-up in Boano prices has ended. 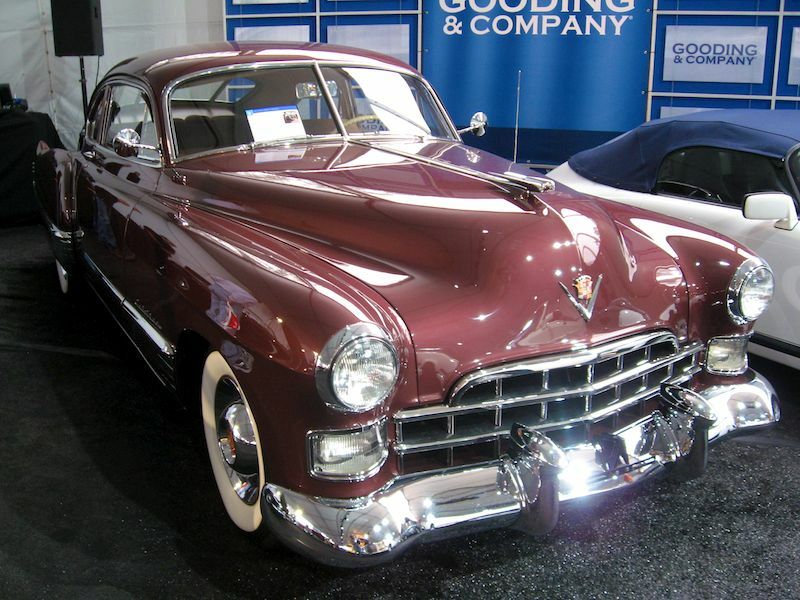 Lot # 028 1948 Cadillac Series 62 Sedanette; S/N 486212213 (Engine); Engine # 486212213; Madeira Maroon metallic/Brown striped mohair; Estimate $65,000 - $85,000; Concours restoration, 1- condition; Hammered Sold at $85,000 plus commission of 10.00%; Final Price $93,500 -- Wheel covers, whitewall tires, radio, dash clock, automatic, front brakes upgraded to discs. Flawless and done to the nines, a very attractive car not seen very often in such magnificent condition. No Reserve. The price is ample endorsement of the impression which this Cadillac makes, a superb car that brought a superb price. 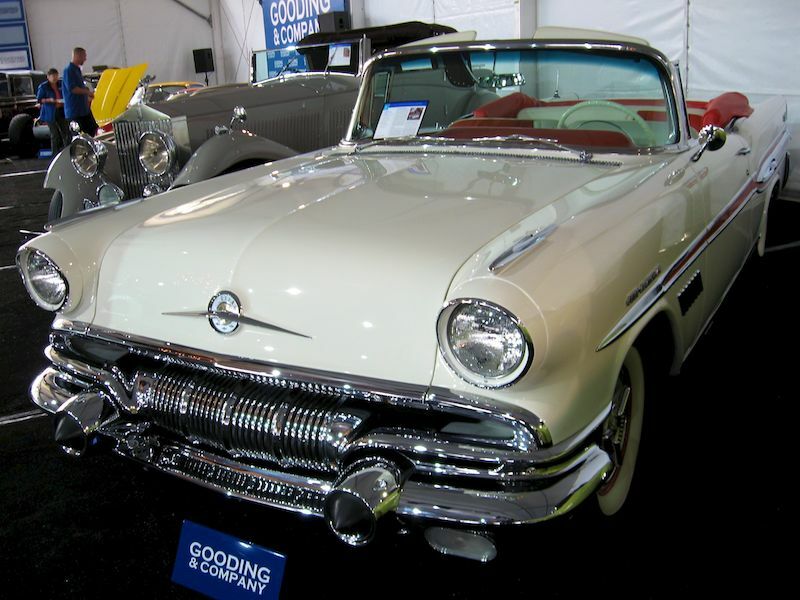 Lot # 030 1957 Pontiac Bonneville Convertible; S/N 8857H35445; White, Red accent/Red, White leather; White vinyl top; Estimate $140,000 - $170,000; Recent restoration, 2+ condition; Not sold at a Hammer bid of $120,000 -- 347/310hp fuel injection, automatic, power top, antenna, steering, brakes, window, seat, Wonderbar radio. Flawless restoration with the only imperfection being delamination on the windshield and vent windows. Show ready. The audience here was paying big money for sports cars and Classics and overlooked the value and significance of this superbly-restored Bonneville. Lot # 031 1941 Lincoln Continental Town Car, Body by Brunn & Co.; S/N H120507; Engine # H120507; Zephyr Blue/Burgundy leather, Tan wool; Estimate $125,000 - $175,000; Older restoration, 2- condition; Hammered Sold at $57,500 plus commission of 10.00%; Final Price $63,250 -- Overdrive, Lincoln heater, wide whitewalls with trim rings, fender skirts, rear seat heater, jump seats, sliding divider, intercom. One of 14 known to have been built by Brunn for Ford. A well executed concours restoration completed in 2004 that is beginning to show its age. Chrome delaminating on the grille, paint showing some wear, but interior and dash still perfect. 2008 CCCA winner, displayed at Pebble Beach in 2005 but needs to be refreshed before going back out on the show circuit. No Reserve. Sold well under low estimate and a bargain for its rarity and unique configuration but more than supported by its frumpy appearance and the work it needs. The buyer paid the right money and now has room to spend more to get it back to show quality condition. Just wanted to send a quick note of thanks for such a comprehensive and knowledgeable review of these results. Fantastic work.